Not much to talk about at the moment. I have a pretty bad cold with a sore throat, so have really just been going to work and then coming home and crashing (I also did a few half-days at work this week, which seems to have helped with recovery time). I am also snoring terribly and keeping Gorgeous Man up at night – so he tells me. 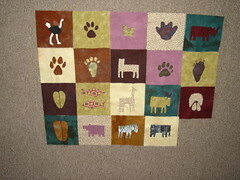 I did manage to finish off another quilt block last night. It is flat in real life, honestly. Only 3 more to applique and then the piecing can start! I’m hoping to get another hat for Hottentots Holland Hospital Helpers finished tonight, and then cast on for something bigger with the beautiful yarn I was sent last week. We’ll see how I feel. 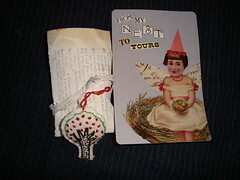 A very cute apple tree which is now hanging on the door to my sewing room/husband’s study. Thank you very much! Erin emailed me a vintage baby cardigan pattern last week and I’m planning on using some of this yarn to try it out. 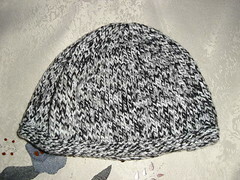 The yarn has already been put on the needles I used yarn from the stash and edged the hat with some of the new white yarn. 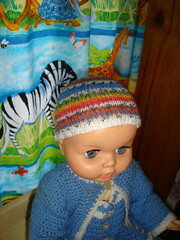 This is for premmies at the hospital (and another one is on the needles). 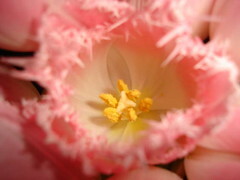 This picture was taken in the nursery and those are the curtains that I made. Gorgeous Man picked the fabric. 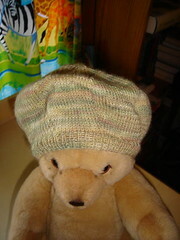 A little beret. They will get handed over on Monday. We had the nursery furniture delivered yesterday. As soon as I have sold the desk that is currently in there, and we’ve got it set up I’ll post some pictures. 29. Nebula Awards Showcase 2004 Vonda N. McIntyre (ed). A collection of science fiction stories. I really enjoyed most of the collection. Well worth a read. 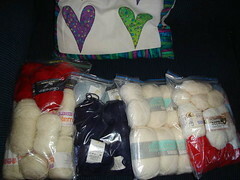 Thanks once again Marianne for the yarn, it’s going to be put to very good use! First up a Finished Object. 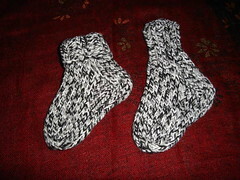 The latest in the knitting for the offspring, a pair of socks – you may recognise the yarn. One with the cuff folded down. 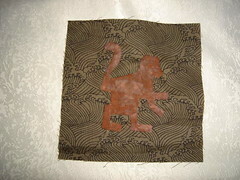 I also finished another applique block – behold the monkey! I’m on the downhill run now – only a few more blocks to go and then I can start piecing them together. 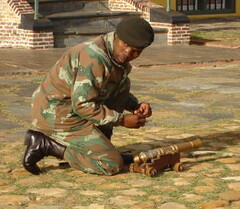 I took the students to The Castle of Good Hope yesterday. This is the view from the courtyard. We got very lucky with the weather. That’s Table Mountain in the background. to signal that all was well. It makes a surprisingly loud noise. Gorgeous Man muttered something about not needing a breeding colony when he saw her, but she was too pretty to pass up, and I got a good price. He will let you take his picture for a small donation. His clothes are made from shredded plastic bags. 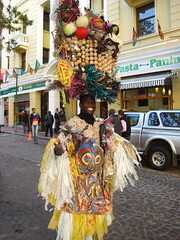 I was impressed with his friendliness and his ingenuity at making a Rand or two. The saddest point of the day was the young boy sniffing paint from an old chip packet and realising that we had just given away our last piece of food to a woman who had asked for money. I encourage the student to give food rather than money if approached by beggars. The highlight of the day was when I was approached by a The Big Issue vendor. I love The Big Issue and believe that it is a wonderful publication that gives dignity and hope to the homeless and unemployed. We always bought it when we saw it in Australia and I was thrilled to see it here. Anyway, I bought a magazine from the vendor and some of my students asked about it, then they all bought one too, and this guy sold 7 or 8 copies in 5 minutes. It made his day too. – your Xmas card arrived today! Post marked 12th Dec 2006!!! I finished a small child’s sock after choir rehearsal last night, but will wait until it has a mate to show pictures. 27. Orchid Fever by Eric Hansen. This was a really good read about the interesting and (very) unusual characters that inhabit the world of orchid breeding, showing and collecting. I think I’m reading less than last year, but I’m quilting more, knitting more, and singing more so something has to give I guess. I’m wearing my jaywalkers under my boots today – yes, it’s cold enough to wear hand-knitted socks. My feet are feeling lovely and toasty. I’m a happy lady. In January we asked that our bathroom cabinet (which was made from chipboard and decomposing onto the floor of our bathroom) be replaced. 5 months and several temper tantrums (on my part) later it was done on Friday. We will not talk about the entire eco-system found living in the actual doors and walls of the cabinet. I settled my self on the couch with a quilt block while the guys worked and Gorgeous Man went out and did errands. Look what he brought home. The weather turned nasty this weekend. 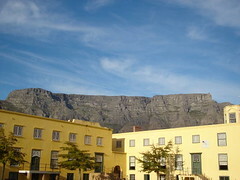 Parts of Cape Town are flooded, and there is snow falling and predicted for most of the high country – South Africa is quite mountainous in parts. Today’s maximum is 13 degrees C (41F). 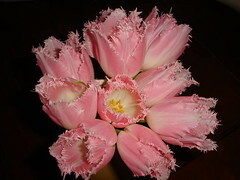 On Saturday the weather was particularly nasty – pelting rain and howling wind. My thoughts strayed, as they always do in weather like that, to those people living in the informal settlements in ‘houses’ made from salvaged materials. Suddenly the little bit of knitting that I do for charity seems woefully inadequate in the face of the need here in this country. Being foreign, and only speaking 1 of the 11 national languages does put me at a disadvantage, but I wonder if there is more that I could do? On a happier note the crochet blanket is making steady progress, and I finished a hat. It’ll match the jumper, but is very big, so may not be worn at the same time. I’m now working on matching socks. 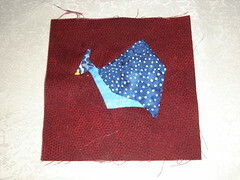 In quilting news the guinea fowl block is done. I did the head twice because I wasn’t happy with the first one. It just needs some embroidered legs, the beak – in yellow, is embroidered too. I’m half-way through a monkey block at the moment. We officially hit the 20 week mark on Sunday which was exciting, but also kind of scary. 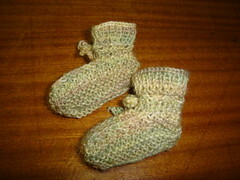 Here’s the latest offering for Hottentots Holland Hospital, a pair of very small booties. Definitely premmie sized. 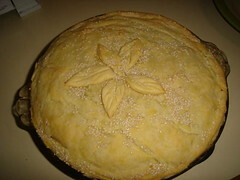 They haven’t turned out terribly well – hence no close-up shots, and the pattern has been quietly disposed of, but they will keep someone warm. 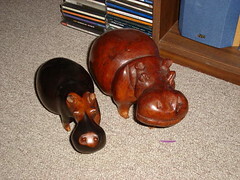 I’ll hand them over at the next quilting guild meeting along with some other goodies. Gorgeous Man informed me this morning that we aren’t finished with furniture for the off-spring’s room. We still need a bookcase – there’s one in there, but it is full and “it doesn’t match”, and I forgot the most important item of all, the nursing chair! Good thing I’m working full-time this year. Still no email – storms yesterday hampered repairs. Today is a lovely sunny day – cold, but sunshine so hopefully soon. Rehearsal again tonight for the performance is over. That makes 4 rehearsals for the week, I’ll be glad when this one is done and I can get part of my life back. I’m feeling a bit weary. We’re feeling a little broke today. We bought the cot and dresser this afternoon. It’s very cute, but a big outlay. Mind you, by buying the floor model we did get a 20% discount, so it’s not as bad as it could have been, and it will be nice to have furniture in the baby’s room. Photos next week when the furniture is delivered and set up in the nursery. The only things left to get now are things like a change mat, bedding for the cot and small stuff like that. The guinea fowl block is coming along well. I didn’t get it finished though (choir rehearsal went a bit longer than expected last night and I need my sleep). It did go faster than some of the other blocks and I’m finding that I’m really enjoying the process of hand work more each time I do it. 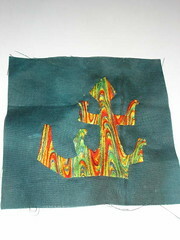 In lieu of a photo of a half-completed applique block here are the blocks done so far. They will be alternated with plain blocks, and some pieced blocks with African fabrics in rows going down, and then sashed between the rows with scraps from the blocks and applique. The centre six blocks will house a large appliqued elephant. Clear as mud isn’t it? We have had no email coming in for a few days, something somewhere got damaged in a storm. Back-up systems mean that we still have ‘net access so I’m not completely cut off. I forget how dependent on email I am until I’m forced to go without it. So if you have emailed me, or left a comment and I haven’t replied that’s why. Tonight is charity knitting night and I’m hoping to finish off a pair of booties and make a good start on a hat. Just a quick question, does anyone have a chemical free way (ie herbal) to keep cats out of the garden. We keep ours locked in at night, but our neighbours’ cats roam the neighbourhood and keep digging (and crapping) in the flowerbed underneath our bedroom window. All suggestions will be considered. Thanks.